Blind Date with a Book @IMMS begins this week. 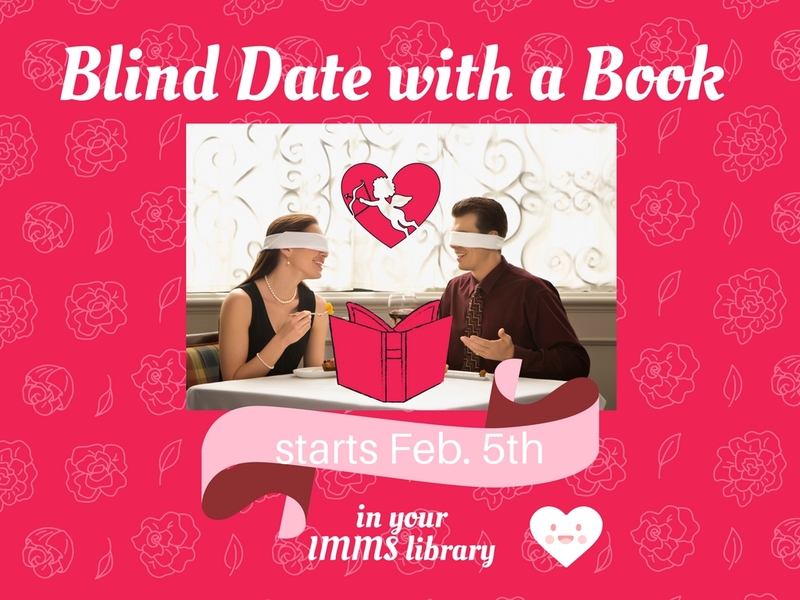 We have limited blind date books available, so only check one out if you are willing to try something new and promise to at least read 30 to 50 pages of the book. After you read this amount you can "rate your date" here on the IMMS Lions' Share blog. Everyone who blogs about their book is entered in a raffle to win prizes and everyone who enters will get a 'sweet treat'. So what should you blog about the book? What about telling what you thought when you first unwrapped it? Did you ever read anything like it before? Would you have chosen this book? Write whatever you like. It's your experience to share. Be sure to post the title of the book and your first name, last initial. What did you think of the book you chose? I'm guessing it was SWEET? My book was hilarious. It was about a girl who everybody thinks that shes like her older brother. But she really isn't. At first i didn't think it was going to be that interesting. I have only read the first 50 pages. My book has been so great so far i'm going to be reading the whole book after this. I think i'm going to be reading more books like this. Jianna B.
Glad you like it. Ms. Bowser and I tried to pick our favorites and books people would like. What was the tile of your book? Let me know what you think when you finish and thanks for entering the contest! Madly is an interesting book, base on the tittle I was thinking of, "Madly In Love" just because of the word "madly". But, my hypothesis was wrong, this book takes you on a journey to a whole new world with witch craft and fairy tale love potion if you think love will never come around well think again Madly takes you on a tour with two girls with the name of Anita and Samantha trying to find true love with a little bit of love potion. As the story goes on giving an exciting romance and a loveable detail bring your mind to a whole big imagination. Once you get your hands on this book you will see what awaits your journey to Madly. What was the title of your book? Did you enjoy it? How did it feel to try something new? I don’t know much about European history but I dare say you do not need to when reading castle in the stars: the space race of 1869. The first volume in what I believe is a series puts forward the question of space travel and what would happen if it was possible to travel in space earlier than history says it was. To that end, the protagonist’s mother, a Clarie Dulac, pilots a hot air balloon up into the heavens to search for a material called aether which can function as what we know as rocket fuel. Unfortunately, things go wrong and she goes missing. Seraphim’s sure his mother is alive but his dad does not hold much hope. Seraphim’s father is a highly sought engineer. This book was both heartwarming and sad. Normally, I wouldn't read a historical fiction, its just not in my interest. But this book has pulled me into it and left me in literal tears. It tells about a young boy who's mother gets taken my drug lords and clings onto hope and will do anything to get her back. It really does show just how much anyone will do to protect the ones they love, no matter how hopeless the ordeal may be. Nice review, Claudia. I'm glad you enjoyed trying something new!